Firstly, the old man it's keep away from the coast but without to take conscientious " Patiently, the old man waits for it to get tired, and the boats slowly drifts far away from the coast..." As a consequence he is alone, so there is nobody around him. He see only the horizon. After, the main character does an allusion aloud about the young boy " I wish I had the boy. To help me and see this ". Here, we understand that the old man isn't reassured. He resent the solitude and he is enough frightened because he asks for help. Somehow, he would like that the young boy to be with him. Then, the old man understand that it's a strong fish. That's why he expresses several possibilities. For example: " Perhaps he is too wise to jump. He could ruin me by jumping or by a wild rush ". 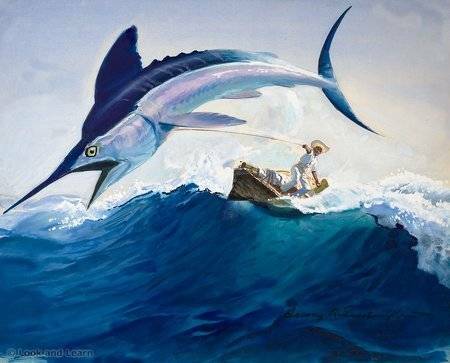 Afterwards, the old man remembers of his past: " He remembered the time he had hooked one of a pair of marlin...which was sharp as a scythe and almost of that size and shape ". At that moment, he appears troubled " he would cut the line with his tail ". To conclude, we can say that this part could be the "frustration stage" of the novel by Ernest Hemingway.